Pork loin comes from the back and side of the pig, running along the back bone, between the shoulder to the hip. The section closer to the ribs is the thickest section of the loin, and, while still very tender, has more marbling. This leads to a juicier and richer-tasting roast. While you can roast this section of the loin at medium heat for the entire time, slow roasting, followed by broiling to brown, leads to fork-tender meat. While it is already tender, marinating or seasoning with a dry rub prior to cooking will give a rib end roast greater depth of flavor. Avoid stuffing the loin to make it easier to cook evenly and to have a juicier roast. Stuffed roasts need to be cooked to a higher internal temperature -- 160 degrees Fahrenheit -- for food safety reasons, but at that temperature, the loin meat begins to turn dry and chalky textured. Rub the outside of the loin with blackening spice -- a blend of paprika, garlic powder, oregano, thyme, salt and black pepper -- for a simple, flavorful crust, or use a blend of fresh garlic, rosemary, lemon zest and olive oil to play up the natural richness of the cut. In all cases, let the seasoning sit for two hours to overnight in the fridge to give the spices time to penetrate the flesh. The standard roasting method involves heating the oven to 350 F, and placing the roast on a center rack in a roasting pan. Cook for 20 to 25 minutes per pound for a 3- to 5-pound roast, and 26 to 28 minutes per pound for a 2-pound roast. This method quickly cooks the meat while keeping it juicy. Tent the roast with foil and let it rest for 15 minutes after cooking before serving. Slow-roasting is a little more involved than the standard oven bake method. While you still place the roast in a roasting pan on a center rack, heat the oven to 200 F, and add 1-cup of liquid to the bottom of the pan. Cook the meat uncovered for 35 minutes per pound for a 3- to 5-pound roast and 40 to 45 minutes per pound for a 2-pound roast. Once the meat is almost fully cooked -- the internal temperature should read around 135 F -- remove the pan from the oven and heat the broiler to 500 F. Place the roast 2 to 3 inches away from the broiler and cook for 5 to 10 minutes until the meat is browned. Tent with foil for 15 minutes before slicing and serving. All pork roasts are safe to eat when the internal temperature reads 145 F. At this temperature, the pork is still slightly pink in the center, which may be off-putting to some people. If you wish to cook the rib end of a loin roast to 160 F, there is less risk of chalky textured, dry meat as this portion is naturally fattier. 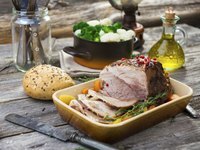 Because a roast will continue cooking for several minutes after it is removed from the oven, undercooking pork slightly, between 5 to 10 F below your target internal temperature, will produce a perfectly cooked roast after tenting and resting. A food thermometer is the only sure way to determine the internal temperature -- and correct degree of doneness -- for a loin roast.